One of the galling minor humiliations Linguet mentions is that of the 'Closet', an enclosure set in one wall of the courtyard where prisoners took their (already brief) exercise. Since even most prison staff was forbidden to see individual prisoners, as soon as anyone else approached, a prisoner had to hide in the Closet. ...the Governor; whose dwelling, as I before observed is without, though his kitchen and his Lady's baths are within: there are some particulars relating to these baths, not less curious than those concerning the clock. 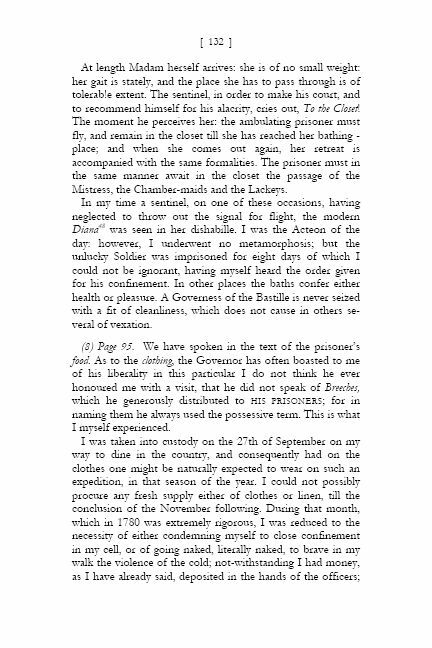 Whether a Governor’s wife bathes here or there appears to be a matter of perfect indifference; and so indeed it should be: but in the Bastille the most trifling circumstance has its consequences, and those consequences are ever afflicting. 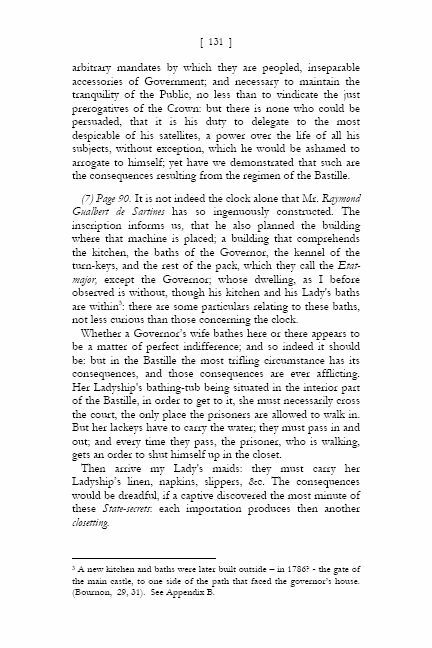 Her Ladyship's bathing-tub being situated in the interior part of the Bastille, in order to get to it, she must necessarily cross the court, the only place the prisoners are allowed to walk in. But her lackeys have to carry the water; they must pass in and out; and every time they pass, the prisoner, who is walking, gets an order to shut himself up in the closet. Then arrive my Lady's maids: they must carry her Ladyship’s linen, napkins, slippers, &c. The consequences would be dreadful, if a captive discovered the most minute of these State-secrets: each importation produces then another closetting. At length Madam herself arrives: she is of no small weight: her gait is stately, and the place she has to pass through is of tolerab!e extent. The sentinel, in order to make his court, and to recommend himself for his alacrity, cries out, To the Closet! The moment he perceives her: the ambulating prisoner must fly, and remain in the closet till she has reached her bathing-place; and when she comes out again, her retreat is accompanied with the same formalities. The prisoner must in the same manner await in the closet the passage of the Mistress, the Chamber-maids and the Lackeys. In my time a sentinel, on one of these occasions, having neglected to throw out the signal for flight, the modern Diana was seen in her dishabille. I was the Acteon of the day: however, I underwent no metamorphosis; but the unlucky Soldier was imprisoned for eight days of which I could not be ignorant, having myself heard the order given for his confinement. In other places the baths confer either health or pleasure. A Governess of the Bastille is never seized with a fit of cleanliness, which does not cause in others several of vexation.